There are still plenty of entrepreneurs digging for business opportunities in the solar industry. Innovation is alive and well in the U.S. solar industry. It's happening at established companies and it's still happening in garages, funded with money from savings, friends and family. Most entrepreneurs just can't help themselves in this regard -- they are driven to invent. I took a contractually mandated stroll down SPI 2015's startup alley to talk to some wild-eyed inventors and sophisticated entrepreneurs. Interplay Learning grabbed the big $5,000 check as the winner of the startup alley competition. CEO Doug Donovan said that his firm is applying digital online learning to technical vocations. Previously the domain of business training and non-contact sports, Interplay is bringing these training techniques to "hands-on practical trades." The startup has already applied the technology to fields like HVAC and robotics. Donovan spoke of marrying gaming technology with instructional design -- something already being done in the military, medical and aviation fields -- and applying it to a "new system of learning" for trades such as solar installation. The company works with 3-D interactive simulation and is prepared to move to a more virtual reality-centric approach when the time comes. How's this for some startup action? No, that's not SunPower's next-gen C7 concentrator; it's the backyard hijinks of DoSun Energy founder, physicist Do Sun Im. He's trying to use a smaller, more precise lens in his alternative approach to the traditional parabolic trough used for concentrating solar power. The company's website suggests initial applications will be used off-grid in developing nations. 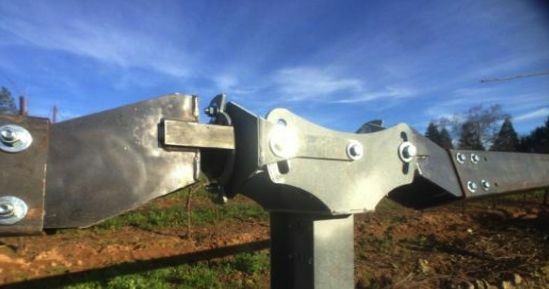 Nevados Engineering has a single-axis solar tracker design using flexible joints which reduces the need for earth-moving and grading. 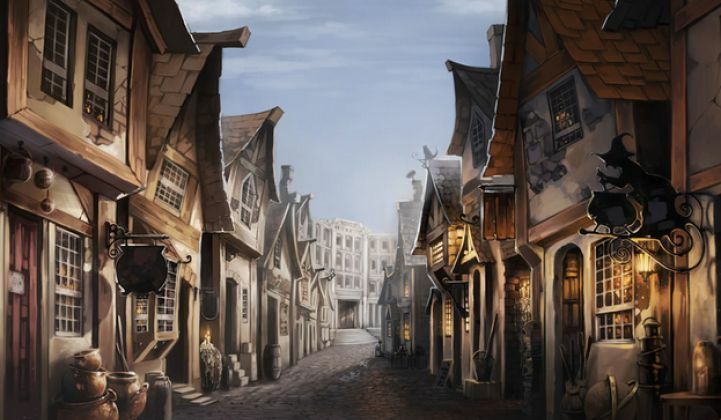 The company suggests that the device allows developers to build "where they could not before." According to an NREL report (PDF), the solar industry spent ~$1 billion to flatten and grade land last year, based on site preparation costs of $5,000 to $25,000 per acre. 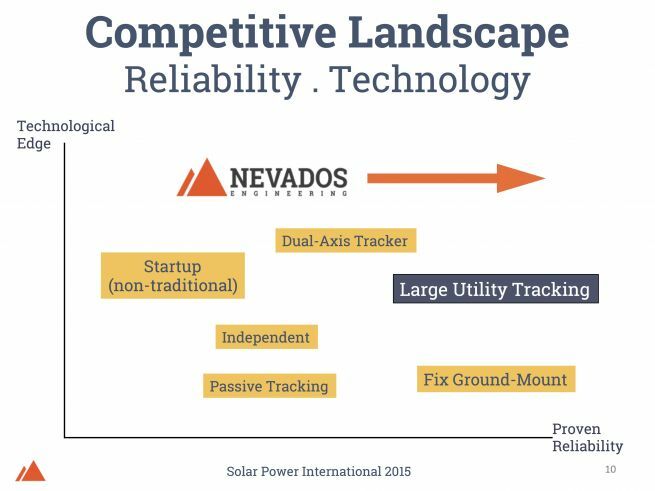 Here's how Nevados sees its place in the competitive universe, according to its slide deck (PDF). The company's product is best suited to "geographic locations with high demand for solar and limited site-grading capability, politics, or economics (Hawaii, North Carolina, CA Coastal, Islands, S. America)." Anar Solar's Mark Pelletier is aiming to commercialize a "side-slope ballast installation" for solar deployment on landfills. Its ballast system uses corrugated drainage pipes located above ground. The startup's ballasted platform design provides "a foundation for each array that will not damage the landfill cap or disrupt landfill settlement, making it possible to install on any terrain with no impact to the cap or the site environment." In the words of Administrator Gina McCarthy of the U.S. EPA, "I cannot tell you how exciting it is to be at another landfill." Kevala Analytics is applying a time- and location-dependent value analysis across California "to assess solar PV’s value...over the typical life of a solar asset" and giving customers "access to real-time, dynamic energy and environmental data." LightManufacturing designs heliostats for use in manufacturing applications. UtilityAPI was also lurking around Startup Alley. GTM's Jeff St. John just reported on the company, which is "taking on another choke point in the solar customer acquisition process -- the cumbersome and time-consuming process of getting utilities to cough up their customers’ energy usage and billing data. Today, that involves phone calls, authorization forms and long waiting periods, a gauntlet that can turn some customers away and add significant costs to serving those that do stick with it." "UtilityAPI’s software can automate that process, allowing would-be customers to authorize the release of their data simply by filling in a few boxes on an online portal, according to CEO Elena Lucas. From there, its application programming interfaces (APIs) can pull data from utility smart meter databases and back-office billing systems, and translate it into formats that solar companies need to determine which customers are a right fit for solar and which aren’t." The Oakland, Calif.-based startup has integrated with California’s big three investor-owned utilities -- Pacific Gas & Electric, Southern California Edison, and San Diego Gas & Electric. Bert Thin Films is developing nanoparticle inks using copper while "maintaining the durability of the silver pastes" for solar module production. The technology comes from researchers at the Conn Center for Renewable Energy Research at the University of Louisville. Sunstall provides ramming and pile-driving services for solar project construction. YouSaveWithSolar.com provides a consumer-facing website that compares installation quotes from trusted installers and eases the solar sale process. GTM's Stephen Lacey reported on solar shopping platforms here. Sunvestment Group has developed a financing model "which allows at least a portion of each project to be funded by the community." X3E Solar Exchange is an online transactional platform for solar project developers and investors. Startup Alley was sponsored by Clean Energy Trust, ModSolar, and Morrison & Foerster and judged by John Alvarado of Edison International, Dan Kennedy of CalCEF, Susan Mac Cormac of Morrison & Foerster and Jigar Shah of Jigar Shah Consulting.